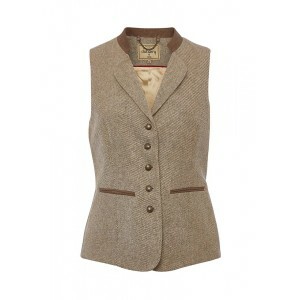 Dubarry&apos;s Moorland tweed jacket for women is a key ladies&apos; fashion piece in Teflon coated tweed. With an asymmetrical buttoned front and smart fitted shape, Moorland is perfect for both country life clothing style and an urban chic look, city style. The elegant and flattering silhouette is achieved thanks to clever seaming detail and a waist insert. Team with Dubarry knitwear for women, stretch jeans and Dubarry leather country boots or Chelsea boots. Dubarry&apos;s Moorland tweed jacket for women is a key ladies&apos; fashion piece in Teflon® coated tweed. With an asymmetrical buttoned front and smart fitted shape, Moorland is perfect for both country life clothing style and an urban chic look, city style. The elegant and flattering silhouette is achieved thanks to clever seaming detail and a waist insert. Team with Dubarry knitwear for women, stretch jeans and Dubarry leather country boots or Chelsea boots. Teflon® coated 100% Pure New Wool; fully lined in Dubarry branded Jacquard. Dry clean only.